DETROIT RUNNER....: Do I live in Michigan? Do I live in Michigan? 8 miles on the schedule today......done but I'm still trying to shake this cold. Unfortunately, it feels like I'm getting an ear infection now. Off to the doctor! 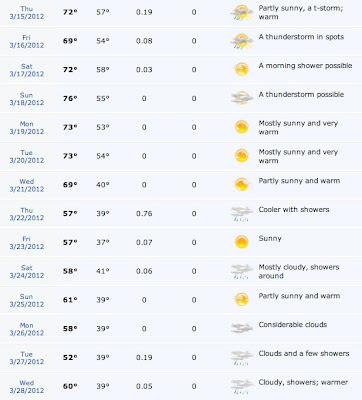 On a positive note, check out this forecast. Yes, we really are in Michigan in March! Amazing! Even the low's are awesome! And check out Sunday's forecast for the ShamRock N Roll Run - 76 for a high!!!!!!! This winter has been one of Michigan's best summers ever! Eat some Garlic and beetroot... hope you feel better soon. Notice on Thursday the 22nd 57 is considered "cooler". Ha, I think that is still above average for this time of year! I love this crazy warm weather we are having, just hope it doesn't translate into crazy hot summer! Type 2 Diabetes - the easy way out? Hyland Post #11 - Great week! Desi sighting? and awesome run!!! Less than two week for my first race -- join me! Hyland Post #10 - were half way home!